Virtual reality is all the rage these days for gamers, but a new trend is exactly what marketers seek to jump on. Ideally marketing tells a story and uses as many senses of the audience as it can. With VR’s immersive nature, that storytelling can be much more lively. And that makes it more fun for the audience. An ad in 360 degree form will be much more memorable than billboard on the highway. 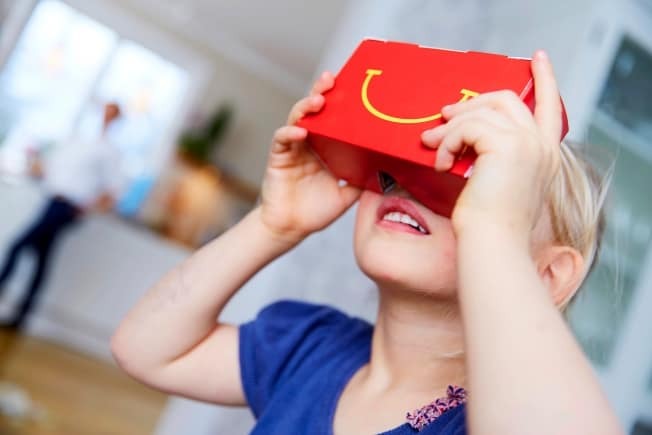 McDonald’s is beta testing a Google Cardboard-esque device in Sweden, made from a happy meal box. Here’s to hoping kids don’t get Fry-eye after assembling. People are already using VR to skydive, watch movies, and tour real estate remotely. Wouldn’t you be more interested in advertisements if they were interactive and immersive? That’s what marketers are counting on. Welcome to your new future.